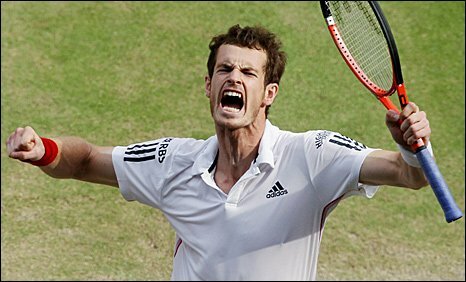 Does Murray have the fortitude to win the two next biggest games of his life? Andy Murray reached the Wimbledon semi-finals for the second time with a battling four-set win over France’s Jo-Wilfried Tsonga on Centre Court. The British number one came through a tense encounter 6-7 (5-7) 7-6 (7-5) 6-2 6-2 in two hours and 48 minutes. Tsonga was close to a two-set lead in the second set tie-break but a poor misjudgement let Murray back in and the fourth seed never looked back. The Scot will play world number one Rafael Nadal in Friday’s semi-finals. Murray’s first Wimbledon semi-final 12 months ago ended in defeat by Andy Roddick, and things will not get any easier this year against Nadal, but he is in good enough form to feel optimistic of becoming the first British man to reach the final since Bunny Austin in 1938. Men’s singles title is up for grabs!…there’s little to choose between Nadal, Murray, Berdych and Djokovic. The 2008 champion was one point away from being on the receiving end of a first-set whitewash before gradually getting on top of his opponent to win 3-6 6-3 7-6 (7/4) 6-1. Nadal said: “He started so well with some very powerful shots, it was very difficult. “I had some problems in the first game of the second set at break point but after that I improved. Novak Djokovic claims he would “give everything” to reach a Wimbledon final and is now just one step from reaching his goal after romping to an easy victory against Yen-Hsun Lu in the last eight. The third seed was imperious as he ended Lu’s fairytale run at the quarter-final stage with an accomplished performance on Court One. The Serbian’s 6-3 6-2 6-2 victory secured his place in the semi-finals at the All England Club for the first time since 2007. Tomas Berdych now stands between Djokovic and a place in Sunday’s showpiece match after the 12th-seeded Czech stunned reigning champion and top seed Roger Federer. 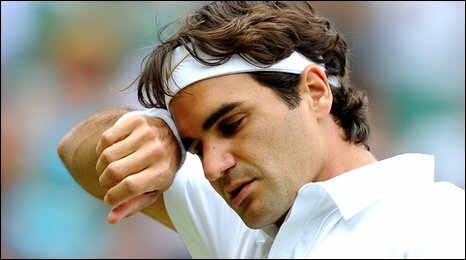 Champions fall at Wimbledon….Federer and the Williams sisters. Tomas Berdych pulled off the biggest win of his career as defending champion Roger Federer crashed out of Wimbledon. Federer, who has won the men’s singles title in six of the last seven years, became the latest casualty in a tournament of shocks as he went down 6-4 3-6 6-1 6-4 to the world number 13 on a stunned Centre Court. The result was greeted with widespread disbelief as the Swiss ace joined last year’s runner-up Andy Roddick and women’s second seed Venus Williams through the exit door. Berdych, who had lost eight of his previous 10 meetings with Federer, becomes the first Czech to reach the semi-finals of the Wimbledon men’s singles since Ivan Lendl 20 years ago and is aiming to become the first winner from his country since Jan Kodes in 1973. Standing in his way in Friday’s semi-finals will be third seed Novak Djokovic, who has beaten him in both their previous meetings. 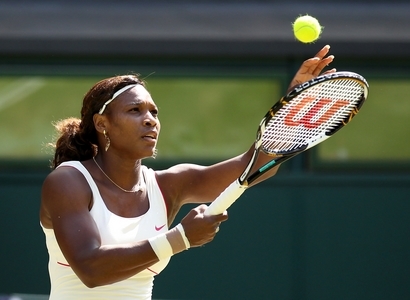 The Williams sisters were knocked out of the ladies’ doubles at Wimbledon on Wednesday. Venus and Serena, the current champions at all four of the Grand Slam events, were beaten 3-6 6-3 6-4 by the Russian duo of Elena Vesnina and Vera Zvonareva at the quarter-final stage. It had all started so well for the top seeds, winners in SW19 in 2000, 2002, 2008 and 2009, when they took the first set. However, the Russian refused to fold and battled back by winning the second. When the Williamses lost serve midway through the decider, the crowd sensed trouble. And although the Americans had the chance to bounce back in the 10th game, they missed two break-back points at 15-40. The win means Zvonareva is now in two semi-finals in SW19 – she plays Tsvetana Pironkova in the singles semis on Thursday. Venus has no thoughts of retirement…. Venus Williams has reassured her fans that she has the desire and ability to add to her seven grand slam titles despite her shock Wimbledon defeat by Tsvetana Pironkova. Williams was dumped 6-2 6-3 by the world number 82 as her quest for her sixth triumph at the All England Club ended in the quarter-finals. The 30-year-old has not won a major title since her 2008 success at SW19 but she insists the defeat by the 22-year-old Bulgarian is not evidence she cannot win another. “I’ve done it before and have the experience to do it,” she said. “So that’s not a doubt for me. “I hate losing. I think any time you accept losing, it’s definitely a good time to walk away. Williams also dismissed suggestions she could be close to retirement, saying: “Why wouldn’t I want to pursue this? I’m pretty good at it most days. “Today I didn’t seem to be the best tennis player, but for the most part, I rock and roll this game. Doubles duo will not return to the WTA tour. Martina Hingis and Anna Kournikova both ruled out returning to the WTA Tour after reuniting to win an exhibition match at Wimbledon. Kournikova suggested Hingis would have no problem fitting in, but the Swiss five-time singles grand slam winner dismissed the prospect of making a comeback. Both will play World Team Tennis tournaments, alongside modern-day stars and veterans of the game, but the prospect of serious competition on tour appeals to neither player. She added: “You can’t pop up and say, ‘I’m going to come back and win grand slams’, even if you have a great partner. “It’s great fun to be out there again with Anna. We had some great times. We’re sharing some good times again. “I did it. I had my comeback. I was very happy with it. I lived through all the emotions. I missed it when I was away for three years. That’s why I did the comeback. “Now it’s different. I’m going to be 30 years old (in September). Kournikova, who turned 29 earlier this month, has not played seriously since 2003, and she looked the least capable of making a comeback as she teamed up with Hingis for a 6-2 6-4 victory over Britain’s Sam Smith and Anne Hobbs. 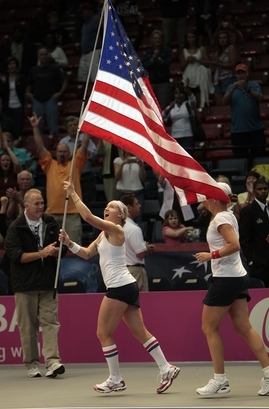 San Diego will host the 2010 Fed Cup final in November. The 2010 Fed Cup final between the host United States and reigning champion Italy will be held at the San Diego Sports Arena in California. The best-of-five tie will be held from November 7-8 and mark the first time the U.S. has hosted the final since 2000, when the Americans captured their record 17th title. This will be the second consecutive Fed Cup final between the U.S. and Italy, which hopes to be led by French Open champion Francesca Schiavone. The Americans are 9-1 all-time versus Italy, but the Italians prevailed 4-0 in last year’s finale in Reggio Calabria. The two-time champion Italians are in the Fed Cup final for the fourth time in five years. They captured their first-ever title in 2006. Serena will face Kvitova in the semi final. Serena Williams reached the semi-finals with a 7-5 6-3 win over Li Na. The top seed saw her sister Venus crash out to Tsvetana Pironkova before she came out to face ninth seed Li. Serena did not have things all her own way either, but Li played a poor service game to drop the first set. The world number one was broken for the first time at 5-2 in the second set but broke again to seal a semi-final against Petra Kvitova. Kvitova won a bizarre match against qualifier Kaia Kinepi in 3 sets by coming from 4-1 down in the final set to win 6-4, 6-7, 8-6. She also saved 5 match points on her way to victory. Serena is now the overwhelming favourite to take her fourth Wimbledon title after the demise of five-time champion Venus, who lost to Pironkova only shortly before her younger sister walked out on Centre Court for her quarter-final match. It was perhaps not surprising that Serena was in rather subdued mood against Li. The first set was closely fought until Li double-faulted twice in a gift of a game at 5-5, allowing Serena to serve it out after 45 minutes. The American pumped her fist in a rare show of emotion as she broke for a second time at 2-2 in the second set, and when Li double-faulted again to give Serena a 5-2 lead, the Chinese player’s shoulders slumped. Serena is certain to face a player making their debut at that stage of a major tournament, and she is by far the most experienced of the remaining players in the draw. Only Vera Zvonareva, who faces Pironkova in the other semi-final, has ever beaten Serena and that was four years ago. Venus eclipsed by virtually unknown Bulgarian who will meet Vera Zvonareva in their first Wimbledon semi final. Five-times champion and second seed Venus Williams lost 6-2 6-3 to Bulgaria’s Tsvetana Pironkova in the quarter-finals of Wimbledon on Tuesday. Williams, whose loss meant she failed to reach the final for the first time since 2006, was outplayed from the outset by the world number 82 on Court One at the All England Club. The 22-year-old was able to post four breaks of serve and a 12-to-6 winners-to-errors ratio, giving her the biggest victory of her young career. Williams, meanwhile, struggled with her all-around game throughout the match. Armed with two break points at 2-2 in the first set, she was unable to polish off the game and went on to lose five consecutive games before faltering down the stretch. Last year’s runner-up, Williams committed 29 unforced errors while hitting only 22 winners, mitigating her normal powerful serve and groundstrokes. This marks her earliest exit at Wimbledon since 2006, when she was ousted in the third round. Pironkova, the lowest ranked player left in the women’s draw, will play Vera Zvonareva for a place in Saturday’s final. Kim Clijsters was eliminated in the quarterfinals of Wimbledon by Russian Vera Zvonareva. The 21st-seeded Zvonareva came back from a set down to win 3-6, 6-4, 6-2 Tuesday on her second match point when Clijsters netted a forehand. Clijsters won the first set after breaking the Russian in the eighth game, when Zvonareva had two forehand errors and a double-fault. But the eighth-seeded Belgian was broken four times by Zvonareva in the final two sets, putting the Russian into her first semifinal at the All England Club. Andy Roddick heads home after a shocking defeat by Yen-Hsun Lu. 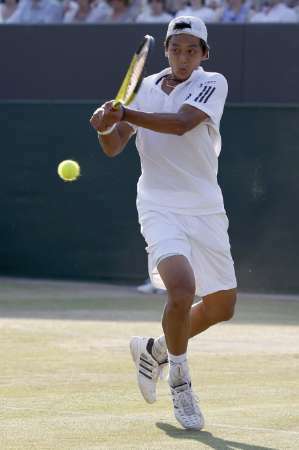 Andy Roddick’s hopes of reaching a second successive Wimbledon final were ended as he was stunned 6-4 6-7 (3-7) 6-7 (4-7) 9-7 by unseeded Yen-Hsun Lu. The world number 82 produced a superb performance and held off a typically spirited comeback from the fifth seed. Yu led 3-0 in the fourth set tie-break but Roddick hit back to level the tie. Roddick had a break point to lead 5-4 in the fifth but Yu saved it and went on to become Asia’s first Grand Slam quarter-finalist for 15 years. His performance emulated that of Japan’s Shuzo Matsuoka, who reached the last eight at Wimbledon in 1995 before losing to Pete Sampras. Yu has never before progressed beyond the third round of a Grand Slam and had never made it past the second round at SW19 in six appearances. He was facing a formidable task in taking on the American, whose Wimbledon record boasts three appearances in the final, one semi-final and one quarter-final. Roddick took the first set with the only break point out on Court Two but Yu took the next two sets, neither of which featured a break point, on tie-breaks to edge ahead in the match. There were also no break points in the fourth set which again needed a tie-break to settle it and after Roddick put a backhand long and Yu held his serve twice, he seemed on the verge of a famous victory. However nerves may then have played a part as after a Roddick ace, Lu put two forehands long to see his lead disappear. The fifth seed then moved ahead and an ace put him 5-4 up. Roddick earned a set point when Lu netted another forehand and the American then produced his 11th ace of the set and 29th of the match to level the contest at two sets apiece. The fifth set was understandably tight but Roddick had his chance to move ahead in the ninth game only for Lu to save a break point and go on to hold. The pressure was now on the 27-year-old as every service game was to keep him alive in the match. It finally told in the 16th game as Lu played a superb passing shot on his first match point to wrap up a memorable triumph. Routine wins for Federer, Murray and Djokovic. Novak Djokovic fended off stomach pain as well as a former champion as he ended Lleyton Hewitt’s Wimbledon campaign in the last 16. The pair met at the same stage in the 2007 Championships and Djokovic came out a winner over four sets, and that was repeated on this occasion as the third seed triumphed 7-5 6-4 3-6 6-4 on Court One. Djokovic called for medical assistance during the third set when he was clearly struggling. He was given medication and later revealed it was a stomach problem that had been troubling him. Andy Murray is through to the Wimbledon quarter-finals after a 7-5 6-3 6-4 victory over Queen’s Club champion Sam Querrey. Murray, yet to drop a set this year in SW19, will next play Jo-Wilfried Tsonga on Wednesday. Roger Federer possesses the coolest head at Wimbledon and dismissed the baking temperatures at the All England Club as “very comfortable” as he breezed into the quarter-finals. The defending champion and top seed barely broke sweat in 80-degree heat on Centre Court as he dismissed Jurgen Melzer 6-3 6-2 6-3 to book a last-eight date with 12th seed Tomas Berdych.